The photograph on the right is an old postcard of Sowerby, date unknown, but was obviously taken before the right hand side of the road was demolished in the 1960's to make way for the Newlands Estate. Newlands Avenue is where the King's Head Inn is. Move your mouse over the photograph to see a description of different parts of the image. 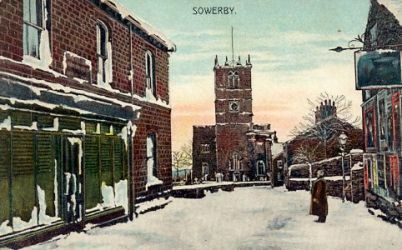 A Brief History of Sowerby from the earliest times. based on Thomas Heap's 1913 photograph taken from the top of St Peter's Church tower - a guide around the village building by building. The day we were bombed!